This toxin-free memory foam mattress is built with natural, renewable resources, making it a safe and healthy choice for your bedroom and for the planet. Visco memory foam envelops you in conforming comfort, while a poly foam base layer provides plenty of sturdy support. Mattress quilting incorporates bamboo-infused memory foam and a soft bamboo-blend fabric for a naturally cool, breathable sleep surface. A unique Aloe Vera treatment enhances the soothing softness of the mattress cover, while attractive diamond stitching makes this mattress an aesthetically pleasing addition to your home. 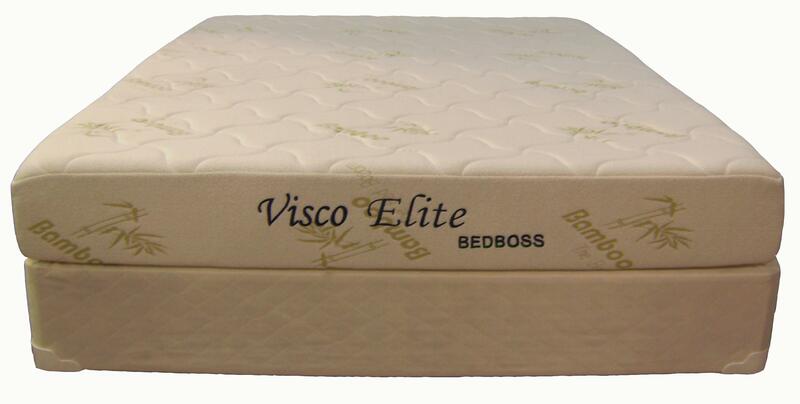 The Visco Elite Full Memory Foam Mattress and Foundation by Bed Boss from Nashco Furniture - Nashville. We proudly serve the Nashville, Franklin, Brentwood, Clarksville, Green Hills, Davidson County, Williamson County, Tennessee area. Product availability may vary. Contact us for the most current availability on this product. 8F Full Memory Foam Mattress 1 8"
Top Soft Blended Bamboo Cover with Aloe Vera Treatment and Diamond Stitch, Quilted with ½" Cooling Bamboo-Infused Memory Foam. The Visco Elite collection is a great option if you are looking for Mattresses in the Nashville, Franklin, Brentwood, Clarksville, Green Hills, Davidson County, Williamson County, Tennessee area. Browse other items in the Visco Elite collection from Nashco Furniture - Nashville in the Nashville, Franklin, Brentwood, Clarksville, Green Hills, Davidson County, Williamson County, Tennessee area.